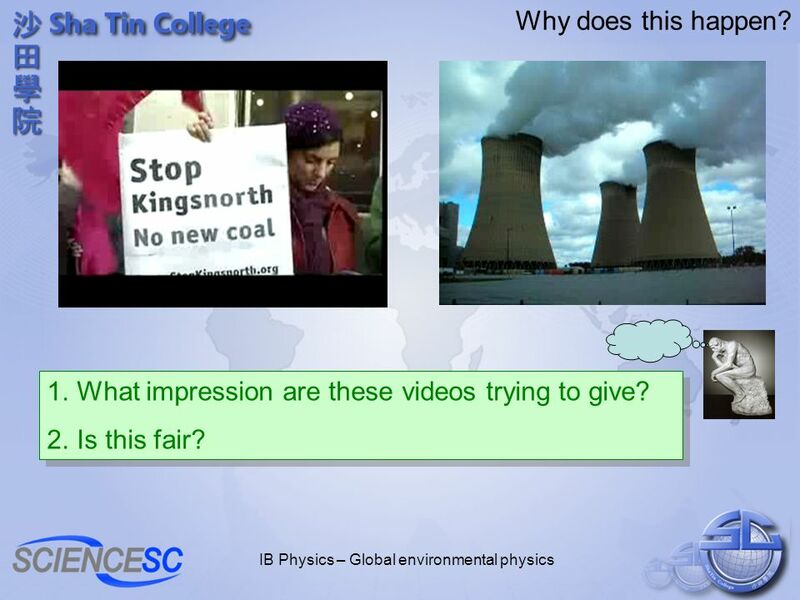 IB Physics – Global environmental physics Where does our electricity come from? Castle Peak, West Kowloon; China Light and Power Lamma Island, outlying. 1 IB Physics – Global environmental physics Where does our electricity come from? 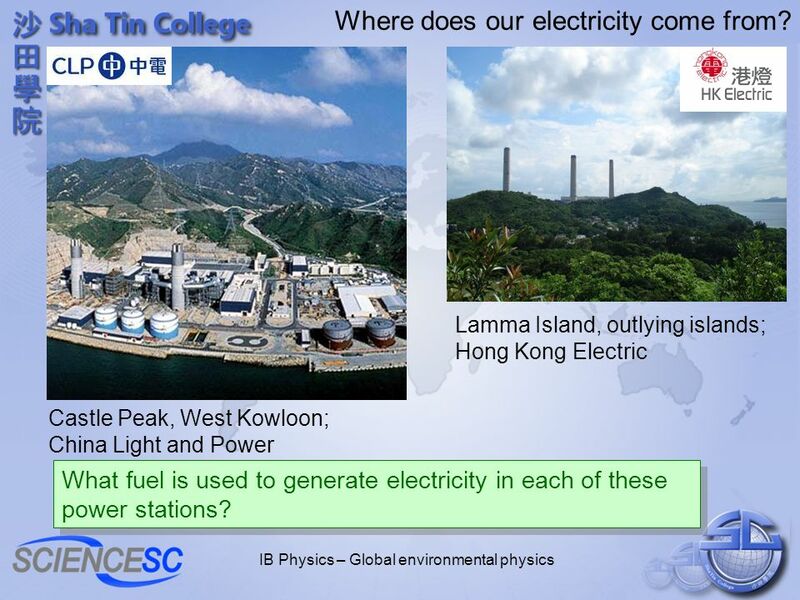 Castle Peak, West Kowloon; China Light and Power Lamma Island, outlying islands; Hong Kong Electric What fuel is used to generate electricity in each of these power stations? 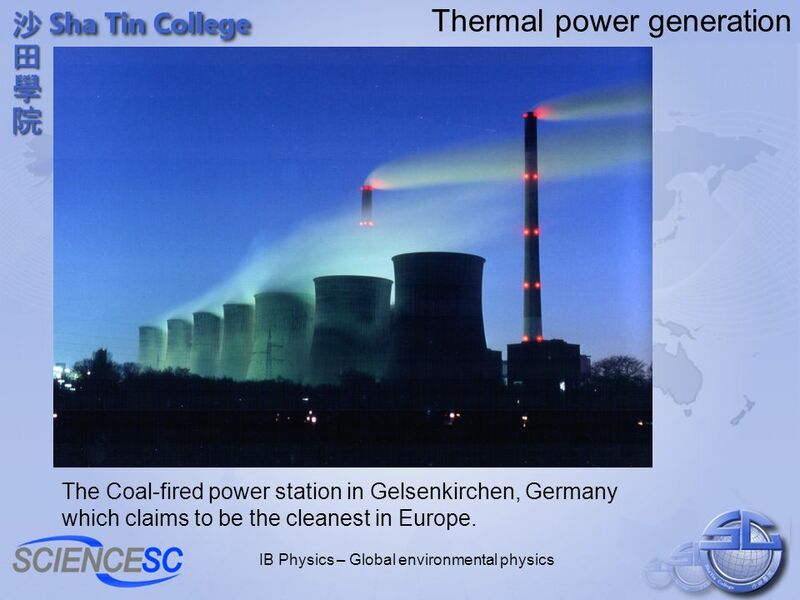 2 IB Physics – Global environmental physics Thermal power generation The Coal-fired power station in Gelsenkirchen, Germany which claims to be the cleanest in Europe. 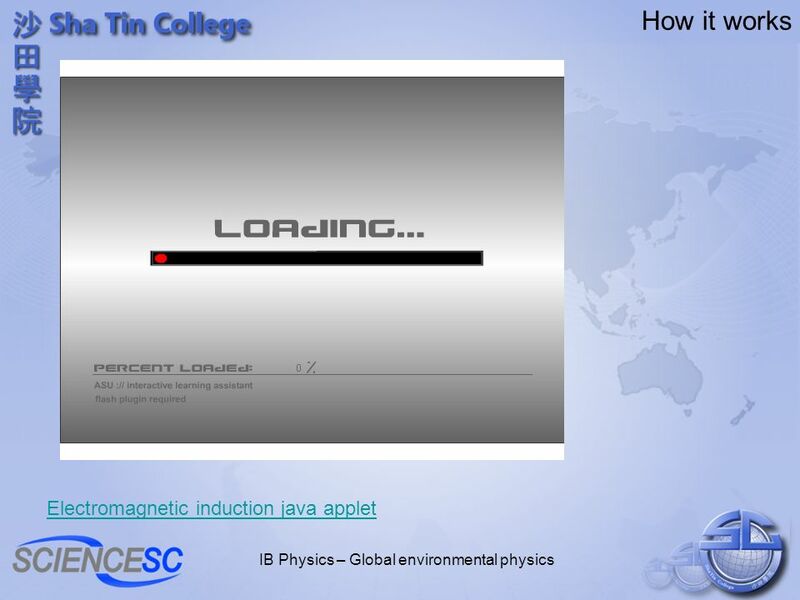 4 IB Physics – Global environmental physics Why does this happen? 1.What impression are these videos trying to give? 2.Is this fair? 1.What impression are these videos trying to give? 2.Is this fair? 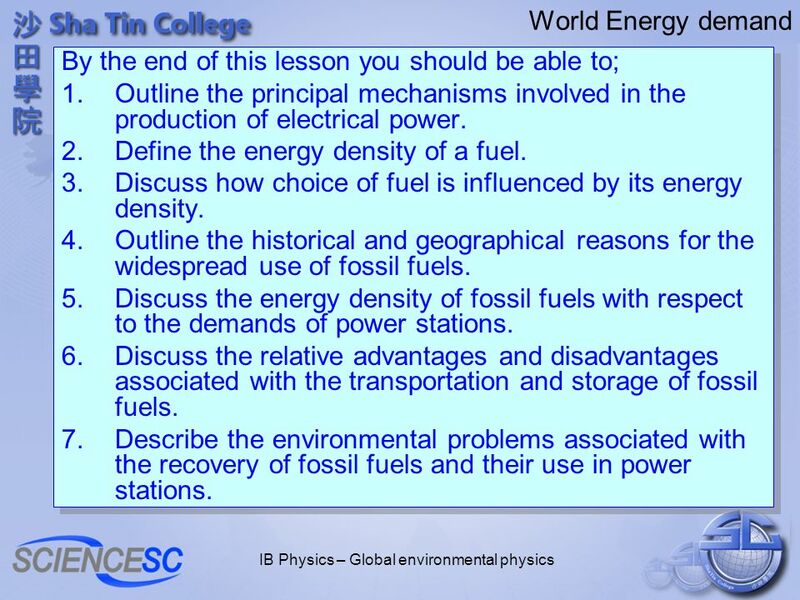 5 IB Physics – Global environmental physics World Energy demand By the end of this lesson you should be able to; 1.Outline the principal mechanisms involved in the production of electrical power. 2.Define the energy density of a fuel. 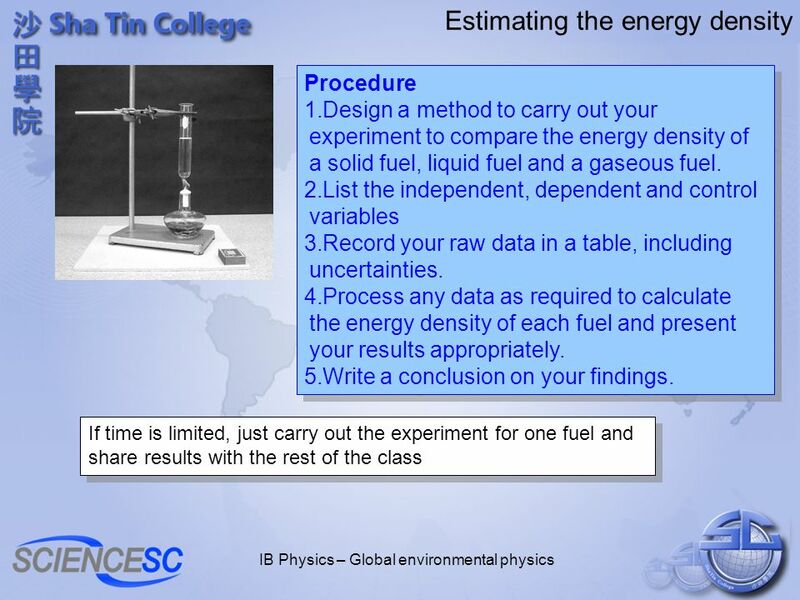 3.Discuss how choice of fuel is influenced by its energy density. 4.Outline the historical and geographical reasons for the widespread use of fossil fuels. 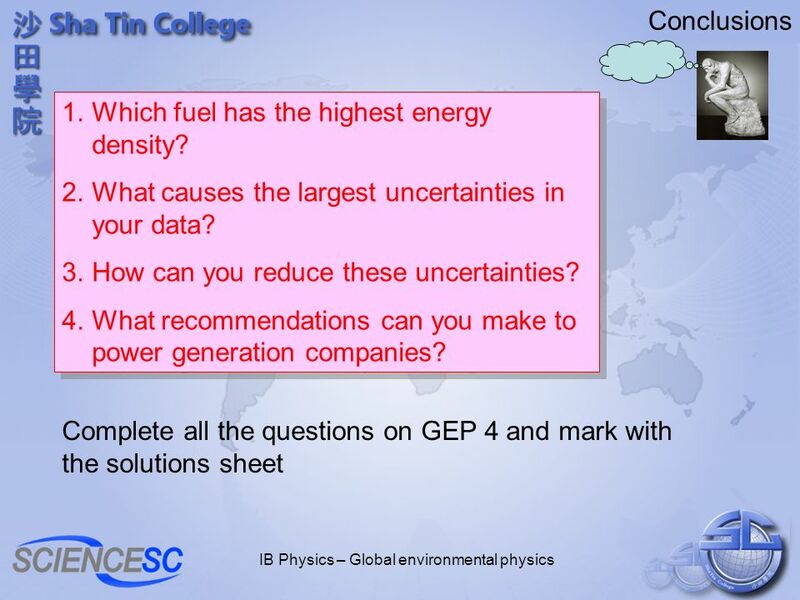 5.Discuss the energy density of fossil fuels with respect to the demands of power stations. 6.Discuss the relative advantages and disadvantages associated with the transportation and storage of fossil fuels. 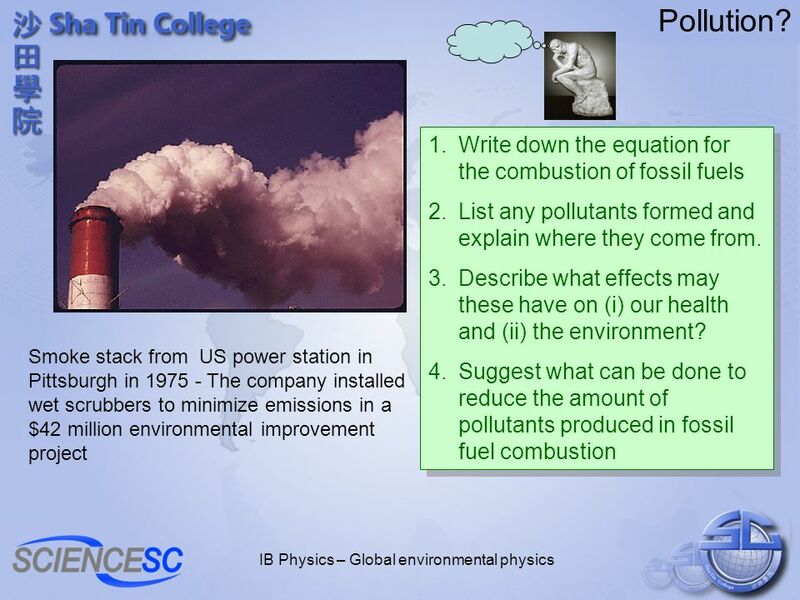 7.Describe the environmental problems associated with the recovery of fossil fuels and their use in power stations. By the end of this lesson you should be able to; 1.Outline the principal mechanisms involved in the production of electrical power. 2.Define the energy density of a fuel. 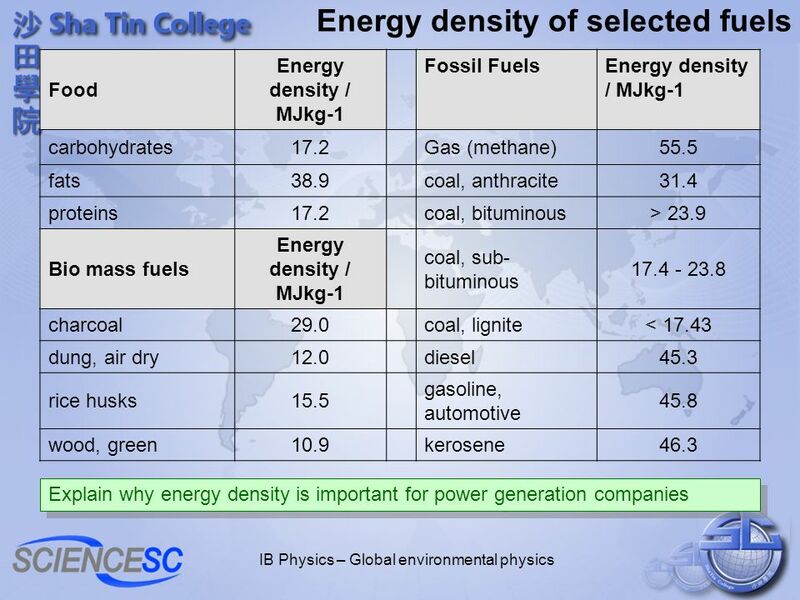 3.Discuss how choice of fuel is influenced by its energy density. 4.Outline the historical and geographical reasons for the widespread use of fossil fuels. 5.Discuss the energy density of fossil fuels with respect to the demands of power stations. 6.Discuss the relative advantages and disadvantages associated with the transportation and storage of fossil fuels. 7.Describe the environmental problems associated with the recovery of fossil fuels and their use in power stations. 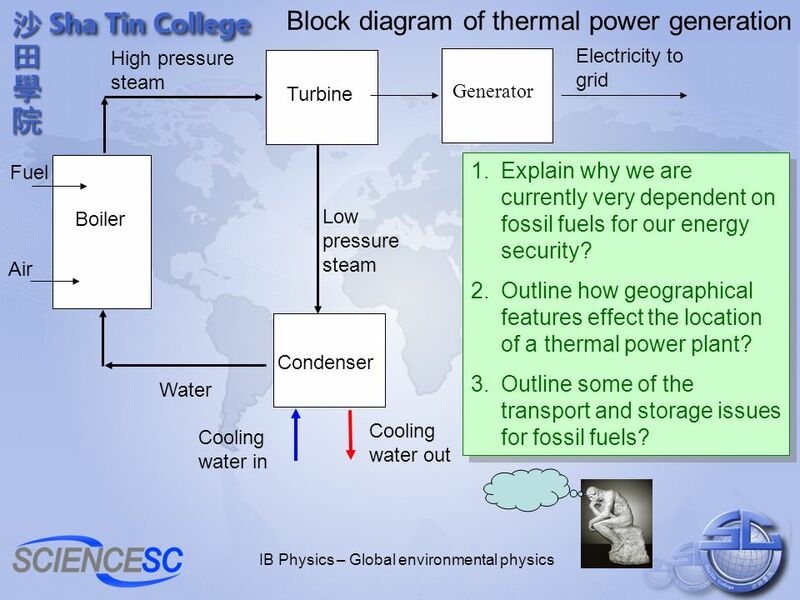 9 IB Physics – Global environmental physics Block diagram of thermal power generation Generator Electricity to grid Water Boiler High pressure steam Fuel Air Turbine Condenser Low pressure steam Cooling water in Cooling water out 1.Explain why we are currently very dependent on fossil fuels for our energy security? 2.Outline how geographical features effect the location of a thermal power plant? 3.Outline some of the transport and storage issues for fossil fuels? 1.Explain why we are currently very dependent on fossil fuels for our energy security? 2.Outline how geographical features effect the location of a thermal power plant? 3.Outline some of the transport and storage issues for fossil fuels? 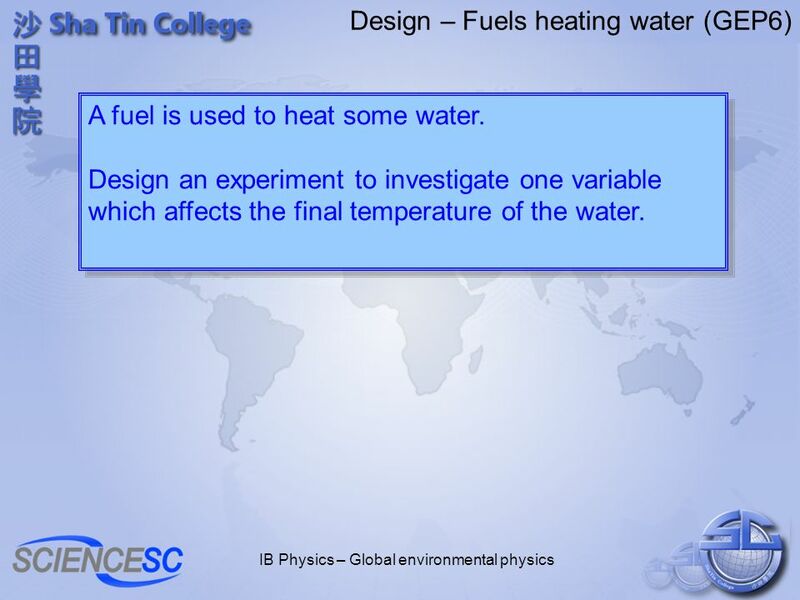 13 IB Physics – Global environmental physics Design – Fuels heating water (GEP6) A fuel is used to heat some water. Design an experiment to investigate one variable which affects the final temperature of the water. A fuel is used to heat some water. Design an experiment to investigate one variable which affects the final temperature of the water. 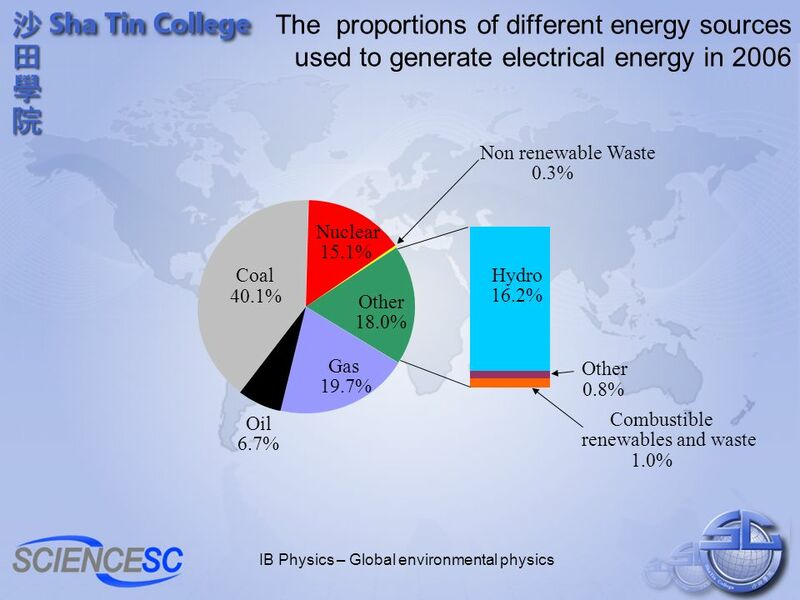 Download ppt "IB Physics – Global environmental physics Where does our electricity come from? Castle Peak, West Kowloon; China Light and Power Lamma Island, outlying." Adrianne, Carina, Liz FOSSIL FUELS. Oil Coal Natural gases WHAT IS A FOSSIL FUEL? ENERGY Where does our Energy come from?. Where does our energy come from for…? Electric light Mobile phones Power for your mp3 TV Hot Water. 1 ENERGY Gr. 5 Science: Conservation of Energy & Resources BY Full Name Science Unit PowerPoint Outline by Miss Berndl 2009. Formation of Coal The coal that we use today comes from the remains of plants in swamps millions of years ago After much time and pressure, plant remains. Lignite Project By Ramic, Haris. GLOBAL OUTLOOK FOR ENERGY World energy consumption is projected to increase at about 1.8%/year between 2000 and 2030(driven. 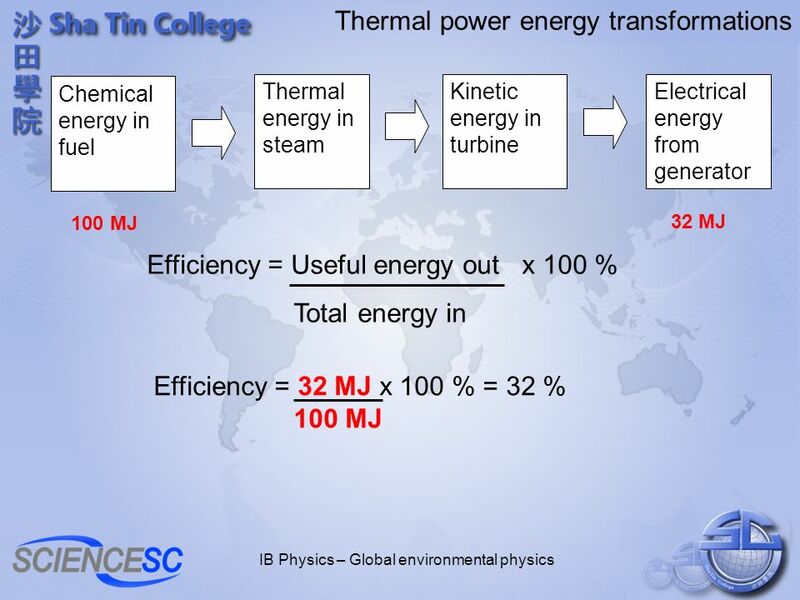 Energy Conversion and Conservation. Conversions Between Forms of Energy  Energy Conversion: Is a change from one form of energy to another.  Most forms. 8.3.1Outline the historical and geographical reasons for the widespread use of fossil fuels Discuss the energy density of fossil fuels with respect. Generating Electricity Physics 1 GCSE ScienceChapter 10. Pros & Cons Env. Effects General Oil Coal Stages 50 40 30 20 10 20 30 40 50 10 20 30 40 50 10 20 30 40 50 10 20 30 40 50.